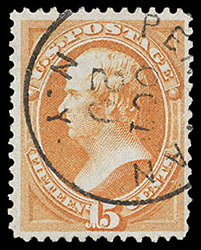 1870, 1¢ ultramarine, H. grill, horizontal strip of 3, town and cork duplex cancels, well centered throughout, rich vibrant color and discernible grill on each stamp, Extremely Fine, a very scarce multiple, especially in choice condition; with 1999 P.F. certificate. Scott No. 134 $600 for singles. 1870, 15¢ orange, H. grill, neat town cancel, strong bright color, discernible grill impression, Very Fine, very scarce bearing a town cancel; with 2018 P.F. 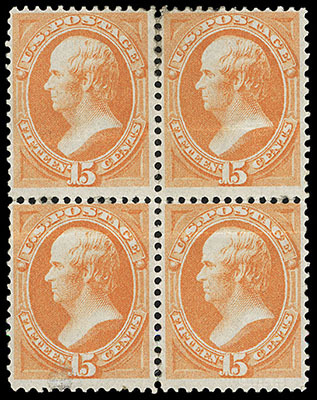 certificate Graded (VF 80). 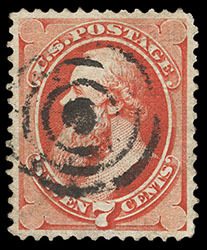 1871, 7¢ vermilion, I. grill, target cancel, rich bright color, well balanced margins and a clear well defined grill impression, Very Fine to Extremely Fine; with 2017 & 2018 P.F. certificates, the latter Graded (VF-XF 85, SSV $1,500).